If you are a new runner, you probably admire more seasoned runners who are able to run for extended periods of time without stopping. Learning how to run without stopping isn’t something you can learn overnight, but there are practical steps you can take to help you develop this skill. Being able to run for a longer period of time will help you get the best results from your workout. How To Run Without Stopping ? The best way to ensure better endurance is to choose the best location for your run. Ideally, the terrain should be flat, free from traffic and accidental bumps. It should also be feasible to run there in different types of weather. As you become more used to running, you can change the terrain to help you work different muscles. Ideally, every week you should have a different terrain varying from soft to off the road. Softer terrains allow for quick recovery while off road terrains train your muscles more. ​Instead of tensing your muscles like many have the habit, try and relax your muscles while you run. This way you will use less energy and give your body the chance to endure longer runs. Another common mistake runners make clenching their jaws and raising their shoulders both habits of which require more energy. Instead, relax your shoulders and jaw while you run. View your running clothes and shoes as an investment that will help you get the best results. Never use worn out shoes and make it a habit to replace shoes that have to be used for 500 miles or so. Make sure you get ﻿﻿high quality, properly fitting shoes that provide the comfort you need. Also use shirts, shorts, and jackets that remove moisture from your skin avoiding fabrics like cotton. ​Breathable fabrics are ideal for running. On top of the list are synthetic fabrics which not only lets your body breath but helps to regulate body temperature. The secret in building stamina and endurance in the running is to be consistent from the very start. Pace yourself so that you are not too slow but neither too fast that you hurt yourself. Find your personal rhythm that you feel you can maintain for a long time. The first thing to develop is endurance and slowly you can increase your speed. Before your run, make sure you drink at least one glass of water before and have enough water to sustain you throughout your run. Staying hydrated ensures that your body gets enough oxygen. How much you sweat - obviously, if you sweat profusely during physical exertion, you will need to drink more water than someone who doesn’t sweat as much. ​The weather conditions - during different seasons, different amounts of water is lost by the body so ideally, the amount of water you drink will change season to season. One of the causes of side stitches is shallow breathing so to avoid this, make sure you breathe through your belly, not your chest. Also breathe through both your mouth and your nose to ensure that you get enough oxygen. It is a common belief that the proper way to breathe while running is to inhale through the mouth and exhale through the nose, but this isn’t true at all. The more oxygen you can inhale, the better so utilize both your nose and mouth when you breathe. Find personal favorite melodies that make you feel good and give you energy and take these along with you on your run. Listening to music as you run helps you get distracted and also helps you run at a steady pace. Focusing your attention on something else helps you forget about how your body feels which will help you run for a longer time. Positive self-talk can do wonders in helping you reach your goal. ​Imagine how it would feel to finally be at the finish line and keep this picture firm in your mind. ​It also helps to break down your run into smaller runs to help you keep motivated. Str﻿﻿﻿etching your muscle﻿﻿﻿s before a run will help them reach their highest efficiency helping you to endure longer. In addition, warming up is a good way to prepare your mentally for what is ahead. Make sure you stretch the major leg muscles you will be exerting during your run. These are ten easy tips that every runner can apply to develop better endurance. Did you enjoy them? 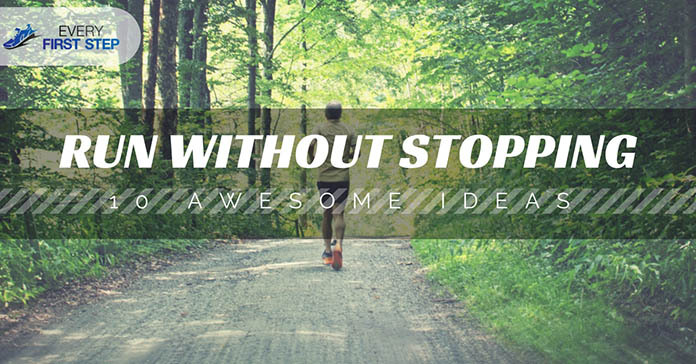 Being able to run without stopping will not only help you lose weight but will boost your self-confidence as well. There is nothing like the feeling of accomplishment once you reach your goal and the great thing is you can always keep challenging yourself creating longer runs.